In the late 19th century, traditional Russian culture enjoyed a revival. Among the artists to reimagine his country’s idealized past was Konstantin Makovsky, the subject of a new monograph survey at Hillwood Estate, Museum & Gardens in Washington, D.C. (February 13 to June 12). Organized by Wilfried Zeisler, Hillwood’s associate curator of nineteenth-century art, Wendy Salmond, professor of art and art history at Chapman University and Russell E. Martin, professor of history at Westminster College, “Konstantin Makovsky: The Tsar’s Painter” explores the artist’s career and popularity in Russia and America. The Moscow-born son of an amateur painter and a composer, Makovsky briefly joined the Wanderers, a group of social realists who left St. Petersburg’s Academy of Arts. Choosing security, he became a professor at the Academy and launched a successful career with his flattering portraits of Russian high society. After the death of his first wife, Makovsky traveled to Egypt followed by Paris, just as the French Impressionists were holding their first exhibition. Along with Ilya Repin and Vasily Polenov, Makovsky was part of the Russian art colony in Paris founded by Alexei Bogoliubov. Makovsky experimented widely, producing everything from academic to Renoir-like canvases. “The Tsar’s Painter” is installed in cereal heiress and collector Marjorie Merriweather Post’s former movie theatre. The show centers on A Boyar Wedding Feast, a crowd favorite at Hillwood and the first in Makovsky’s series celebrating traditional Russian customs. Before Peter the Great’s sweeping reforms and transfer of the capital to St. Petersburg, powerful boyars dominated sixteenth and seventeenth century Moscovite politics. 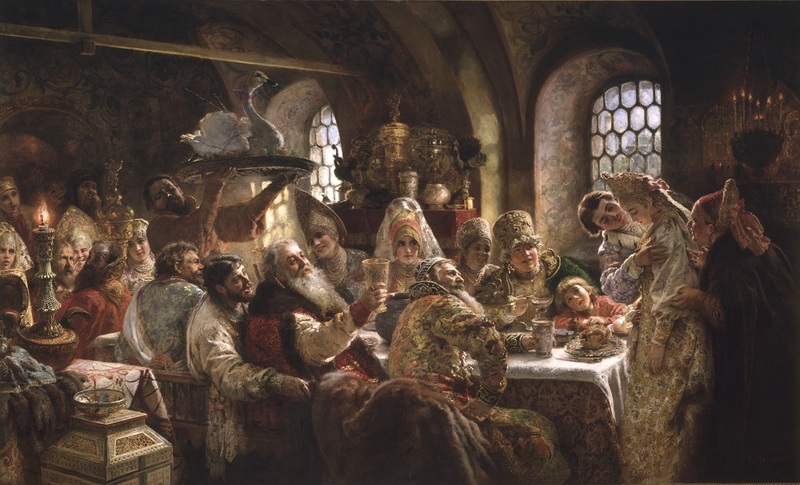 Tapping into Russia’s fascination with its past, Makovsky set his colorful, richly detailed scene in a room inside the Kremlin, choosing the dramatic moment toward the end of the traditional wedding feast. A servant carries in a platter of roasted swan, symbol of fertility, to present to the groom. A tableful of elaborately costumed guests toast the bridal couple, who must kiss to sweeten the wine before leaving for their wedding night. The subjects of Makovsky’s monumental canvases were no accident. As Martin writes in the exhibition catalogue, Makovsky consulted a number of historical sources — including the Domostroi (a manual from Ivan the Terrible’s reign) and foreign accounts of pre-Petrine Russia. To add further authenticity to his scenes, Makovsky collected antiques, textiles and costumes to use as props. His cast of characters was inspired by people he knew, including his beautiful second wife Julia Pavlona Letkova, model for many of his boyarinas. A striking collection of decorative objects like those in A Boyar Wedding Feast are also on view. Among the standouts are a mid-eighteenth century jewel casket in carved walrus ivory and wood, and a late 1600s tumbler in silver gilt and niello — an ancient technique of decorating engraved metal with black designs practiced in seventeenth century Russia. The curators have recreated the silver and gold laden buffet from the painting, displaying late 19th century electrotype copies of the so-called “Russian Treasures” – Russian and German made objects housed in the Kremlin and Hermitage (lent by the Metropolitan Museum of Art). Among the precise replicas are a decorated platter, eagle-shaped cup, and a globe-shaped bratina. Makovsky filled a cupboard in his studio with colorful sarafans and elaborate kokoshniks, traditional women’s headdresses. A wonderful pair of mother-of-pearl studded kokoshniks are on view, along with two women’s outfits and a man’s ensemble. The dashing silver brocade coat, trousers, gloves and boots were worn by Admiral Nikolai Volkov (adjutant to Grand Duke Alexei) to an “Old Russian” costume party thrown by Nicholas II in 1903 at the Winter Palace. Back in Paris in 1889, Makovsky fell in love with his third wife, Maria Alekseevna Matavtina, thirty years his junior, who also became his muse and model. Though he may not be a household name today, Makovsky enjoyed fame in the U.S., where he travelled in late 1901. Newly elected Theodore Roosevelt sat for Makovsky in the White House Cabinet Room, his first official presidential portrait. Four smaller paintings and works on paper by Makovsky, including a portrait of the artist’s daughter, round out the display. One of Makovsky’s most avid Gilded Age patrons was a German-born, New York jeweler. Charles W. Schumann bought A Boyar Wedding Feast and The Judgment of Paris (Fabergé Museum, St. Petersburg) and commissioned Choosing the Bride (Museo de Arte de Ponce, Puerto Rico). The latter depicts a young Tsar Alexei selecting a spouse at a Kremlin-hosted bride-show. During his career, Makovsky portrayed three generations of Romanov tsars and their families — Alexander II, Alexander III, and Nicholas II. A pastel portrait by Makovsky depicts Russia’s last tsar before his fall, wearing a winged helmet and gold and silver lace adorned uniform of the Imperial Cavalry Guards. Konstantin Makovsky wouldn’t live to see the end of the Romanov dynasty. Two years before the Russian revolution, the 76-year-old died in St. Petersburg when a tram hit his horse-drawn carriage. Thanks to the abstract work of artists like Kazimir Malevich and Wassily Kandinsky, a revolution was also about to take place in Russian art.